I've got some exciting news to share! First of all, let me say thank you to everyone who has supported us throughout the years. You've been incredible and we're all looking forward to hearing your feedback on our upcoming games. 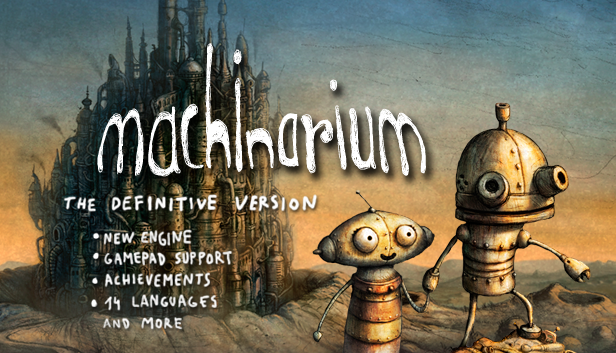 It's been almost 8 years since Machinarium was released on Steam and it's become one of the most recognized indie games of all time. We are still very proud of what we've achieved, but we are also aware that the technical core of the game has not aged well. So we decided to make a brand new "definitive" version. What's new? Most importantly, the game will be running in our custom made DirectX engine (no more Adobe Flash). That means you will finally be able to play Machinarium in full screen even on modern high resolution displays. The definitive version of the game just feels much smoother and more polished. And we're adding 12 Steam achievements, 14 languages, controller support and Steam Cloud saves. See the full changelog below! The definitive Windows PC version is going live very soon on Steam. Please be aware that your old save files will be deleted once the game is updated. We're still working hard on a Mac version, thank you for the patience! Non-Steam versions of the game will also be updated soon. Also: There is a Steam community discussion about this rollout HERE.